on the 14th March the new House of Koorang Gallery Opened in Nowra NSW. This is the first retail gallery store for Mundara and Novy after running an Indigenous wholesale for over 12 years. 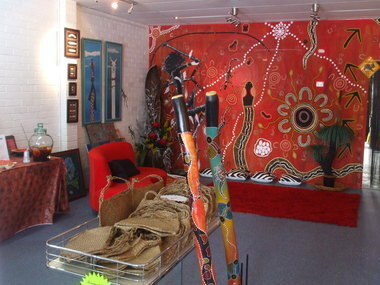 The House of Koorang Gallery has one side wall vacant for local young Indigenous artists. The gallery will be closed on Mondays as this is the day that schools can bring their students for Dreamtime stories and Cultural discussions at no charge. The gallery store also offers handmade jewellery, boomerangs, prints and candles, incence and oils made in Australia from Australian Indigenous flora and fauna. Novy has introduced her designer jewellery, chokers imported from American Indian tribes, pendants from Africa and Egypt and is awaiting permission from a Mauri Elder to be able to introduce Mauri items into the gallery. 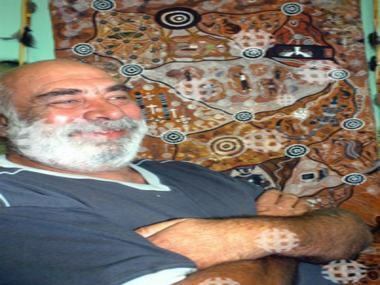 Mundara and Novy are endeavouring to hold annual Indigenous art and writing competitions for the Illawarra area. 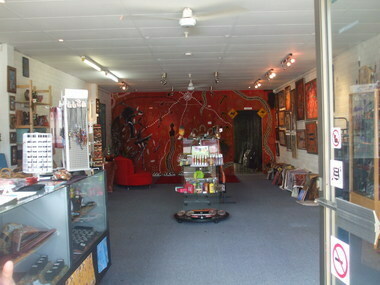 The House of Koorang Gallery is located at shop 1/ 90 Worrigee Street Nowra NSW 2540. Contact Novy on (02) 4422 6025 or 040 8989819 for more information. Just having a brouse through the gallery it is looking good.